Castleford Tigers boss Daryl Powell is backing his players to respond positively after their heavy defeat by Betfred Super League leaders St Helens. Conceding eight tries on home soil to the table toppers was a chastening experience for the Tigers and Powell is keen to ensure there is no hangover as his team make the short trip to Emerald Headingley to take on Leeds Rhinos tonight. Cas have been good at bouncing back in recent years and will need to do so again to make amends for their poor display last week. Powell said: “You never want to lose two games on the trot. “It is important to strike back pretty quickly and over the last few years we’ve been great at that. “We have been really consistent in terms of striking back quickly when we lose so this is an important game for us. We’ve just got to play well. “I think at the moment we are a little bit up and down with our form and we want to get back to being a bit more consistent with how we play. Tonight’s opponents surprisingly go into the game bottom of the table despite bringing in some big name players in the off season, but Powell is expecting a tough test as the Tigers look to add to their recent winning record against the Rhinos – they are unbeaten in their last six away games against Leeds. He added: “I coached Dave in 2003. I am pretty sure he will turn it around. “They are a pretty loyal club when you look at what they do with their coaches. “Dave is a real smart man and a pretty durable man as well and I think he’ll just keep getting on with his work. “They have been pretty aggressive with their carries and they are in games at the moment so they are difficult to beat. “But they are getting beat and they will need to turn that around obviously. We’re hoping that’s not going to be on Thursday. “We have got to make sure we are good enough to beat them, but Leeds are a big club, they’ve got some good players in there. 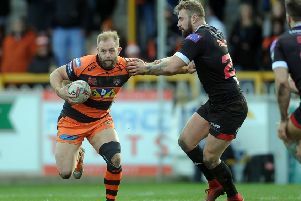 Castleford have big prop forward Will Maher back in contention after injury ruled him out of the early games this season and he has replaced Tuoyo Egodo in the 19-man squad from last week. Powell is hoping Adam Milner and Nathan Massey will be fit to play and has named them in the 19 although Milner did not train at the start of the week and Massey picked up a wrist injury in the St Helens defeat.